Dubai, UAE (April 6, 2019): As part of EKI's ongoing commitments to Corporate Social Responsibility (CSR) initiatives, Repton School Dubai has successfully raised a total of AED 142,000 to further support education programs for underprivileged children in rural Senegal. The initiative, in association with Dubai Cares, is part of the ‘Adopt a School' program that focuses on enriching the lives of children in developing countries by providing access to quality primary education. 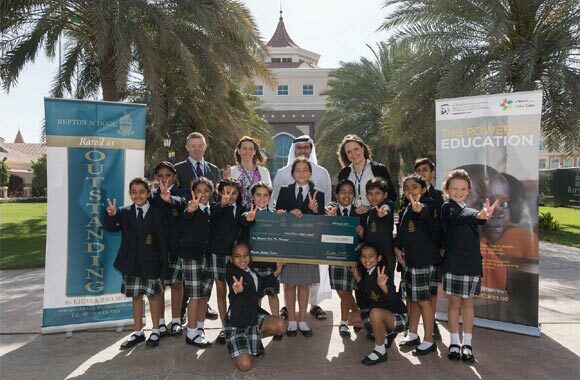 An official cheque handover ceremony was held at Repton School Dubai in the presence of the pupils, David Cook, Headmaster; Michaela Barber, Head of Junior School; Holly Tighe, Student Council Coordinator of Repton and His Excellency Tariq Al Gurg, Chief Executive Officer of Dubai Cares. Through this initiative, Repton School will fund the construction of a two-classroom community-based school in Senegal, providing education for 60 children during the day and 60 adults in the evening in a rural community. Pupils from the Junior School's Student Council along with parents have independently raised a generous amount of AED 142,000 through various fundraising events such as national day stall, winter fayre, Emirati Children's Day and a ‘dirham makes a difference' campaign. A team of 15 people from the Repton community will also be travelling to Senegal in October 2019 to begin building the foundations of the project's first phase. “I'm also very pleased to announce that we are continuing our fundraising efforts to build a second school and double the amount of people whose lives we can help to change for the better by providing the priceless gift of education for local families”, he added.